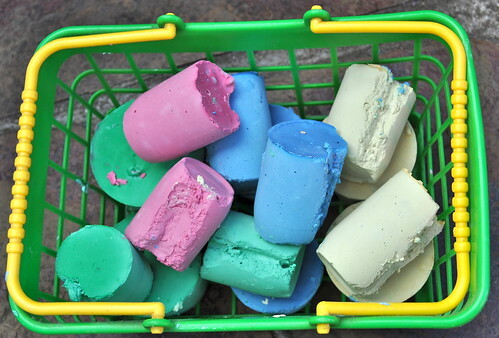 In fact we made a basket of chalks... because they are so easy to make and because we got quite carried away by a fabulously messy project!!! 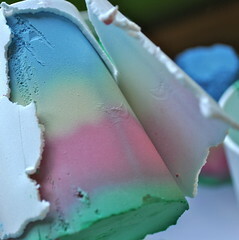 Small yogurt cups and cut the tops off to make tubs. 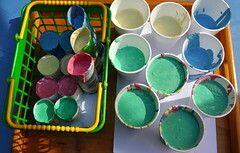 Disposable cups, they are easy to peel off your cups once your chalks are dry. 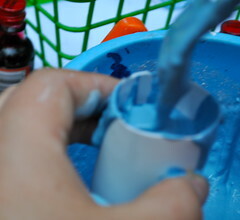 Empty tubes of any kind are great for your chalks when the chalk is still wet, they work like giant squeeze pens. 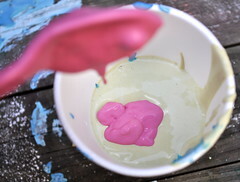 You can also make fancy shapes using ice-cube trays, but the chalks are very brittle and can be hard to pop out of the shape. And plain old toilet rolls. (Stand them up on a piece of paper when you fill them). 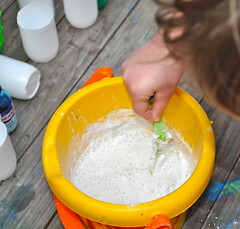 Put your plaster of paris into a bucket. 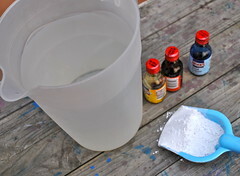 Add a little bit more than the same volume in water. 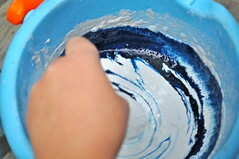 Stir like crazy - it should have the consistency of soft-serve ice-cream. 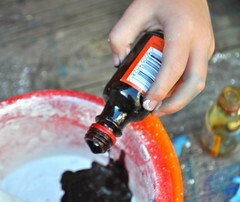 Add your drops of food coloring and stir some more. 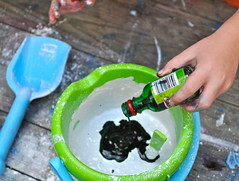 Pour the mixture into your containers. 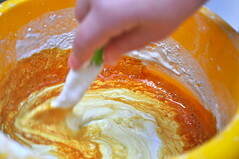 And leave them to dry overnight. 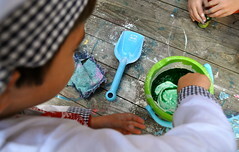 At this stage you may use some of your potential chalks as paints... they make the most fabulous thick outdoor finger paints. 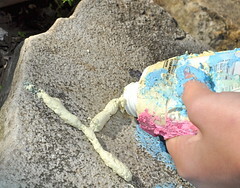 If you cut off the base of an empty tube and fill them... wait a little while for the chalk to stiffen slightly. 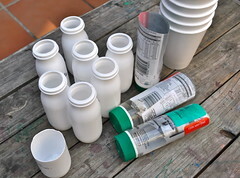 Then just unscrew the lid, hold the end tight shut and squeeze. 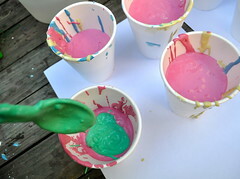 If you are making rainbow chalks then pop the chalks into a cup, one color on top of another. 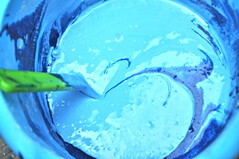 If you want your chalks to be less marbled then let them set between layers. Patience is not an easy taskmaster and our always have a more very marbled look... as we just place the colors on top of one another. 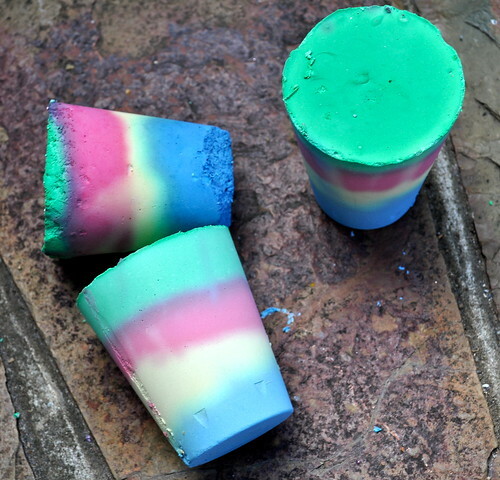 Once your chalks have set overnight, then just peal the cups off and if you made them in plastic tubs then just cut them out using kitchen scissors. 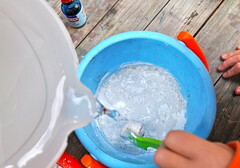 Just one big proviso... DO NOT CLEAN UP IN THE KITCHEN SINK OR INDOORS AT ALL. 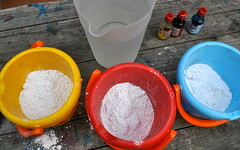 This is an outdoor project, if your kids are anything like mine then they will love the mess of concocting... and you do not want plaster of paris to be washed down your sink... yes I have heard that it can set there and the thought of explaining that to a plumber is more than I can stand.